Fishing Partnership "Narody Severa” LLC is one of the largest fishing companies in Kamchatka Peninsula and specializes in harvesting of aquatic living resources, fabrication of frozen products, screened salted roe and fish meal from various fish species and fish waste. Fishing Partnership "Narody Severa” LLC started its fishing operations back in 1947 known as Fishing Partnership named after Mikoyan. Technological Equipment Engineering Company designed a plant for this enterprise, manufactured and supplied equipment, performed installation works, pre-commissioning, staff training and commissioning in the full fish processing mode in 2014. Vostochny Bereg LLC is located on the eastern coast of Kamchatka in Karaginsky district. The company has been present in the market since 1998 continuously developing and building up its output. In 2012, its management made a decision to develop production facilities including construction of a new fish processing plant, one of Russia’s largest in terms of processing volume and one of most advanced in terms of equipment and technologies. Technological Equipment Engineering Company won the tender, other bidders being companies from the USA and South Korea, and performed all project activities including plant designing, equipment manufacturing and delivery, installation, pre-commissioning, staff training and commissioning in the full fish processing mode. Poronaisky Fur Farm LLC ranks among the largest companies of Sakhalin region. Its key business activity is fish catching and processing. It runs on its own feedstock, catching fish within allocated quotas and using its own fishing areas in Terpeniya Bay. In 2015, Poronaisky Fur Farm modernized its key production asset – an onshore salmon processing plant. Handled by Vladivostok-based Technological Equipment Engineering Company on a turn-key basis, the project comprised plant designing, equipment manufacturing and delivery, installation, pre-commissioning, staff training and commissioning in the full fish processing mode. Okha Fishing Company is located in a similarly-named Okha town, Sakhalin region and specializes in inshore salmon fishery. 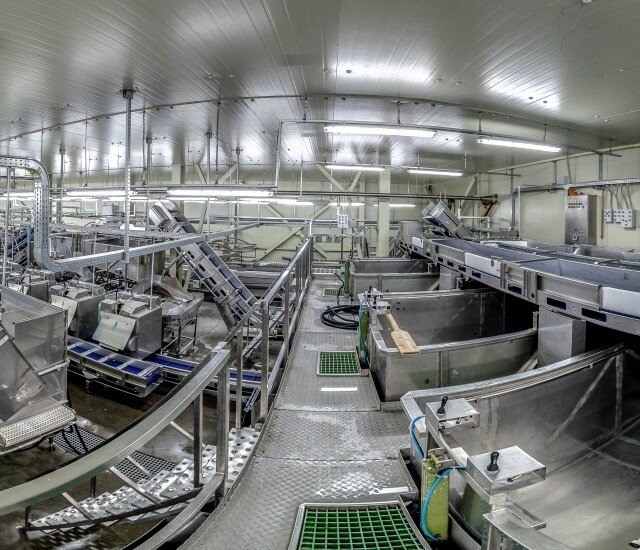 Technological Equipment Company designed an onshore salmon processing plant, manufactured and supplied equipment, performed installation works, pre-commissioning, staff training and commissioning in the full fish processing mode. Its process line designed for fish sorting, dressing, accumulation and packing is a complex consisting of separate components, each one designed for performance of certain inter-related functions. Zyuid LLC is located in Kamchatka region and specialized in inshore salmon fishery. Technological Equipment Company designed its onshore salmon processing plant, manufactured and delivered equipment, performed installation, pre-commissioning, staff training and commissioning in the full fish processing mode. FIC Vostochnoye launched its fish processing plant after a large-scale upgrade just in time for the salmon run in 2015. This plant is located in Innokentyevka village, Khabarovsk region. Technological Equipment Engineering Company replaced utility lines, installed processing lines and state-of-the-art freezing facility, established a roe processing workshop, trained personnel and commissioned the plant in the full fish processing mode. This project was unique in its short implementation time: production facilities have been set up and launched virtually from “zero” during nine months only. The plant is intended for processing of all salmon species. 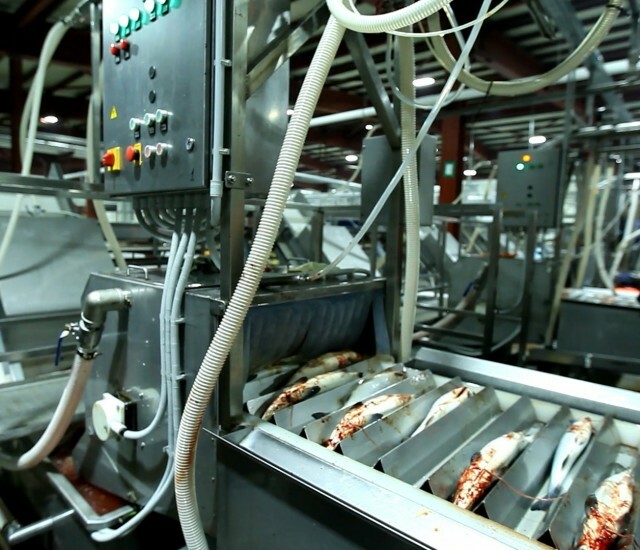 It has become the first production site with a fully renovated fish processing cycle. Vostochny Fish Processing Plant Group of Companies was established in Khabarovsk region in 2005. Its fish processing facilities are economic mainstays for Innokentyevka and Chnyrrakh villages. The company harvests, stores, processes and sells river and sea fish. Its product range includes salmon products, frozen smelt, salted roe and others. Technological Equipment Engineering Company designed the plant, manufactured and delivered equipment for it, performed installation, pre-commissioning, staff training and commissioning in the full fish processing mode. Koryakmoreproduct LLC is located on the eastern coast of Kamchatka in Ivashka village, Karaginsky district. It has been operating in the market during 20 years continuously developing and improving fish processing technologies. In 2011–2012, it has built a new state-of-the-art production facility for salmon processing using waste free technologies. The designer and manufacturer of its process lines was Vladivostok-based Technological Equipment Company. Chistyi Ostrov LLC is a unique project developed and launched by specialists of Technological Equipment Company in 2016. This is a facility for fish waste processing with the production of fish meal and fish oil. The plant is located in the eastern coast of Sakhalin region in Starodubskoye village, Dolinsky district. The company with a symbolical name /TN ‘chistyi ostrov’ means ‘clean island’/ has solved several social, economic and environmental tasks. Ustkamchatryba LLC is a successful and dynamically developing company widely known in Russia and abroad. Ustkamchatryba LLC operates a closed-type production cycle including six fishing areas, onboard and onshore fish processing capacity: they catch, process and supply fish to domestic and international markets. Their onshore production site includes canning, culinary, roe processing, fish meal and fish oil production, and salting workshops. The roe processing workshop produces salted salmon roe. Process lines in the roe processing workshop were designed and manufactured by Vladivostok-based Technological Equipment Company.